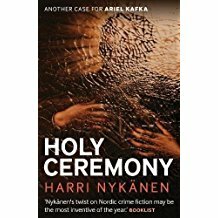 The third outing for Helsinki based cop Ariel Kafka, investigating what his department is slow to categorise as an outbreak of serial murder – perhaps because the deaths have been taking place over several years. Are they looking for a fictionally conventional serial murderer, or are the murders linked for another reason? Are each of the deaths and disappearances murder at all? The perpetrator wants Kafka on the case; he writes to him; later they speak on the phone and, of course, they meet. But the motive remains a puzzle – although the perpetrator’s program is clearly coming to a climax. Historic abuse, a less than harmless secret society and religious dogma lies behind it (not a spoiler: we know this half way through the book) and an almighty tangle it will turn out to be. My main criticism of this and the other Kafka books is that, amiable as he is and well told as the tales are, the denouements are labyrinthine. But this is still an enjoyable read.